Courtesy of the official Parks and Rec Twitter account. Happy Galentine’s Day, all you beautiful tropical fish! 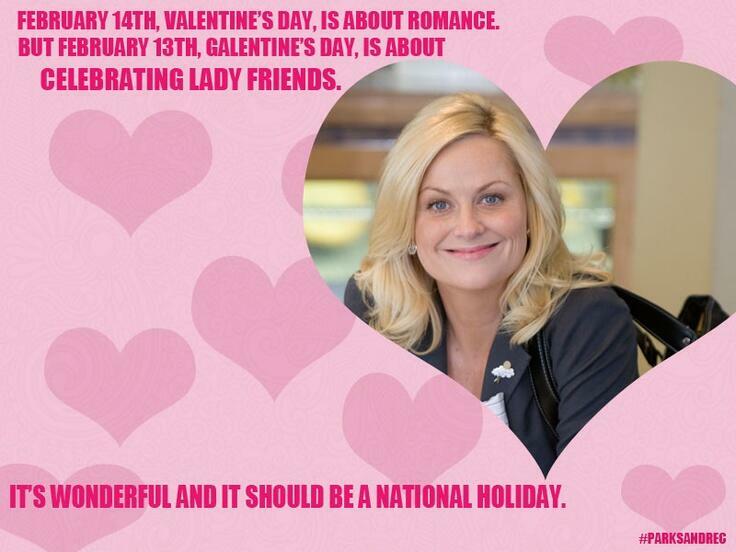 Galentine’s Day is a day created by my personal hero Leslie Knope to celebrate the awesome women in our lives and bask in the power of supportive female friendship. I’ve written about the need for strong portrayals of female friendship in the media the last two Galentine’s Days, and today, Heather has a great post up on her blog celebrating some of TV’s best female characters. So this Galentine’s Day, I wanted to shift my focus from the awesome ladies of television to the awesome ladies who make Nerdy Girl Notes a place where it’s Galentine’s Day all year. It was always my hope for this site to become a place where people—especially women—could gather and talk about the things they loved without people judging them for their emotional investment. Too often, we’re told that our passion is intimidating and our enthusiasm keeps us from being taken seriously. So I always feel a deep sense of pride when I read the discussions that happen in the comments sections here or in my Twitter mentions, and I can see women from all walks of life coming together to share their thoughts and feelings about the media they love. I don’t know how I got so lucky to have a readership and group of regular commenters mainly composed of such strong, smart, and sincerely supportive women. You all genuinely amaze me. You’re scientists and students and amazing writers yourselves; you’re mothers and girlfriends and proud single ladies; you love characters and shows as different and amazing as all of you are. And you choose to share that love—that part of yourself—with me and with your fellow commenters. When I look at NGN’s comments sections, I see a community of women who have strong opinions and aren’t afraid to voice them, but they’re also open and accepting of others who don’t share those same opinions. I see women who are articulate and sincere and encouraging toward not just me but everyone they interact with. I see ladies celebrating ladies for the passionate, enthusiastic, and supportive people we are. Thanks for making every day feel like Galentine’s Day around here. And may your day be filled with friendship, happiness, and delicious waffles. This entry was posted in Holidays and Celebrations and tagged galentine's day, nerd musings by Katie. Bookmark the permalink. I love this a lot. I am so thankful for the piece of the internet you have managed to carve out here at NGN. Your reviews make shows even more enjoyable to watch and the commenters here are the best on the internet. It is truly a space for us to come together and celebrate the shows, characters, and relationships that we love and I’m so grateful for it. There are not words for how much I needed to read this today and how much everything you just wrote is now wrapped around me like a hug I desperately needed this week. I love this site with all my heart and it’s my favorite little corner of the internet by a mile. Whether it’s shows I watch or not what I love is the enthusiasm and discussion here. I love the camaraderie of lifting each other up and reveling in our passions. It’s a great thing and continual source of joy. I was going to simply share that I was so excited to have learned about Galentines Day from you (because as we know I don’t regularly watch Parks & Rec) and as someone who has never been big on Hallmark Holidays (mother’s day, etc. included). This one just strikes me at the heard of all that matters. The power and beauty of women at our best. When my 9 year old asked if we could be each other’s valentines this year it was fun to tell that I had something better in mind. So thank you for that and a Happy G-day to all my fellow Nerdy Girls. Thank you so much for the kind words, and I’m glad this post was the virtual hug you needed. Taking a moment to write it this morning brought me a lot of joy as I reflected on all the wonderful women who call NGN their Internet home, so it makes me smile that I could share that joy with you.